Dystopian science-fiction fairytale retelling. Seriously, who wouldn’t want to read that!? 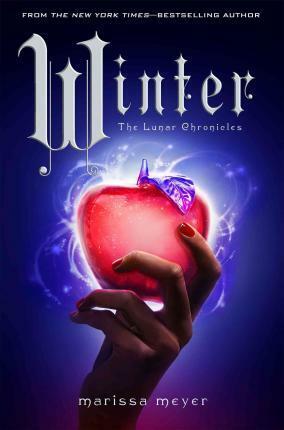 Throughout the first three books (I’m not counting Fairest, as it’s a novella and I never read it), I fell in love with the main characters; mostly Scarlet and Cinder though. Not surprising, because the other characters had a lot less time devoted to them. Because of this, Winter was a little less relatable than the other ‘princesses’; she didn’t seem to add much to the total story. However, it was great to see that someone who deals with a mental illness that is similar to schizophrenia can still be useful and loved even when they’re dealing with debilitating hallucinations. The book is filled with non-stop acting and plotting, which means that even though it’s over 800 pages, there is not a dull moment to be found. It took me a little bit before getting into the story, also due to the fact that I read the other novels over a year ago, but once I was there, I couldn’t put it down.